After passing the sluice of Esna by night, our ship dropped anchor at the docks of Edfu where in the morning about a hundred horse-drawn carriages were waiting for holiday-makers at the quay, to take them to the Horus Temple. This very pleasant action, however, brought the traffic of the small, lively city almost to a standstill, but we reached our destination quite happily without any longer delay. The Ptolomaic temple was once part of a larger area where artefacts of the Old, Middle and New Kingdom were also found. It is dedicated to Horus, the falcon headed god of Egyption mythology. The building was begun in 237 BC by Ptolemy III Euergetes, was extended and embellished then over a period of 180 years and finally finished by Cleopatra's father, Ptolemy VII, around 57 BC. 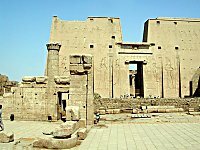 It is the best preserved and, after that of Karnak, the largest temple in Egypt. We were deeply impressed by its dimension, sublime beauty and the abundance of well-preserved, elaborate reliefs, which decorate all walls and columns. 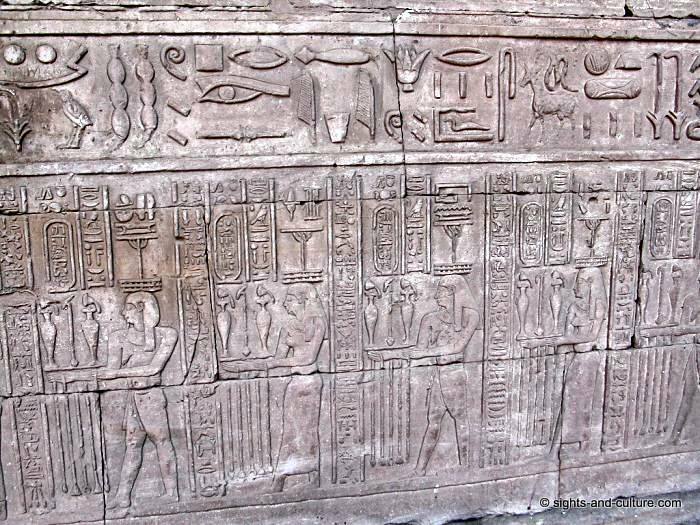 The hieroglyphic and graphic stonemason works report on the erection of the temple, the heroic deeds of the Pharaohs and the mythology of the old Egypt. The magnificent Pylon of the temple has a height of 118 feet and leads into a colonnaded courtyard, which adjoin the marvellous hypostyle hall and numerous further well preserved parts of the temple.